To travel to Midtown Manhattan in NYC from EWR Airport you will need to take either a taxi, train or bus. The quickest option is of course by talking a Newark Liberty Airport taxi. Taxis are metered from the airport, so you can expect to pay around USD$50 (43.80€) and the journey will take around 30 minutes, in low traffic. If you take the train, it will involve a few more transfers, costing USD$12.50 (10.70€). Finally, there is an express bus option from the airport, which takes just over an hour (traffic dependent) and costs USD$18.00 (15.40€). The train journey is the cheapest and fastest of the public transport options due to the avoidance of notorious traffic into NYC. Having said that, there are more stops associated with taking the train, so if you are happy to make the transfers it is a good option for those on a budget. 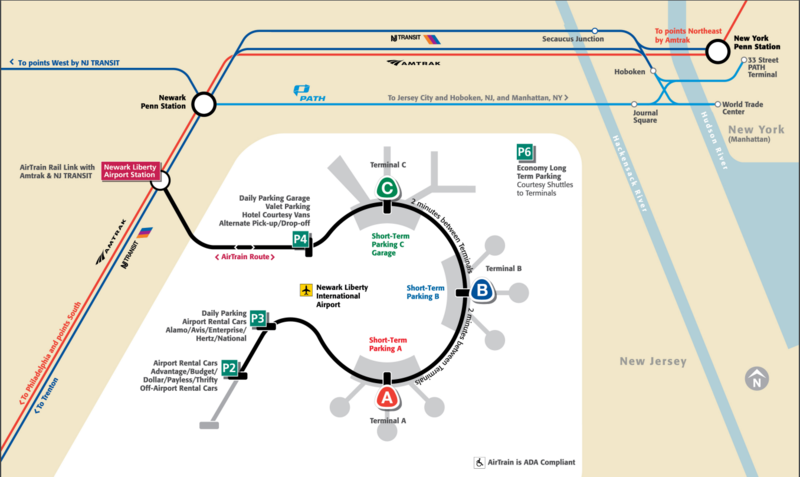 You will need to take the AirTrain (which runs around all the terminals) from the airport to connect with other train services out of New Jersey (such as Amtrak and NJ Transit) at Newark Liberty International Airport Station. From here, you can take the NJ Transit train straight through to New York Penn Station in Midtown Manhattan. The journey (including transfers) should only take around 45 minutes. It can also be quicker in peak times as trains are more frequent. 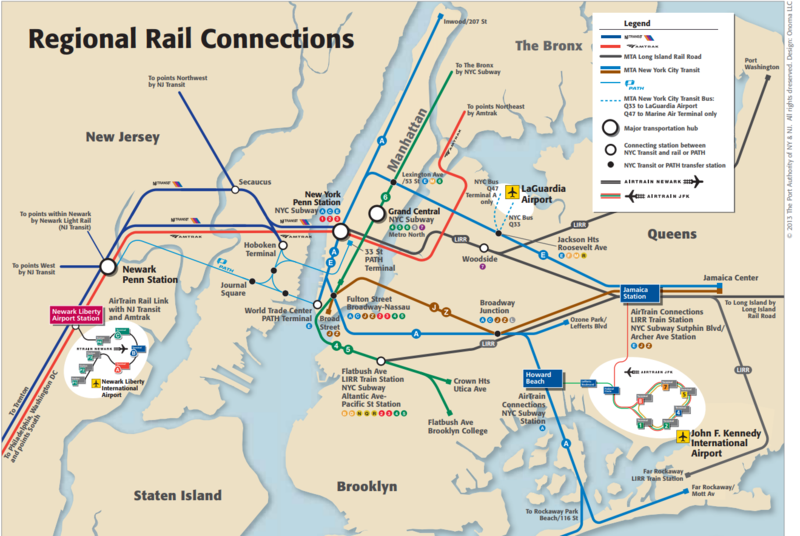 How much does the train cost from EWR Airport to New York city centre? The AirTrain costs USD$5.50 to reach Newark Liberty International Airport Station, however if you purchase a ticket for the onward journey via NJ Transit to Penn Station NY, this price for the AirTrain is included, so you will only need to use the one ticket through your journey, which is USD$12.50 (10.70€). Tickets are available for purchase at the airport station via ticketing machines. The Airtrain is available 24/7 and the NJ Transit Trains operate 21/7 - there are no services running between 2:00am and 5:00am. The Airtrain can be caught from any terminal at the designated stations - these are easily relocatable via signage. NJ Transit trains must be taken from the Newark Liberty International Airport Station, reachable via the AirTrain. The AirTrain can be very fast, especially with more frequent services during the peak hours, which is where the advantage lies over taxis and buses. The cost is also good for those who are on a budget. The downside is the transfers between stations, which can be extra stress for those who have to carry around their luggage. You must always purchase a ticket before boarding. The only time that you are able to purchase onboard is if there is no available machines on the platforms before boarding. You can be fined for purchasing on board if a prior option was available. There are multiple trains that take the route to NY Penn Station, however the Amtrak trains are generally much more expensive. The machines that sell tickets in the station are named 'Quik Trak' machines. The frequency between trains increases in peak-times, can even be only 5 minutes between trains. Newark Liberty Airport taxis are by far the most convenient and safe option of getting to NYC. Taxis in the New Jersey state are covered by official licencing which provides protection from overcharging and similar situations on behalf of the customer, so you can be ensured that you are covered. Unlike NYC, official taxis in New Jersey are 'apple/bright' green. Be sure to take the ones at the rank of this colour if you decide to travel by cab. Taxis from Newark Airport are metered and therefore a variety of factors, such as time of day, luggage and traffic can affect the price of your journey. Luggage is charged for large pieces that are handled by the driver. If you wish to take a taxi, try and avoid rush hours as, during weekday rush hours - mornings (6AM to 9AM) and afternoons (4PM to 7PM) and on weekends (Saturday and Sunday from 12PM to 8PM) - there is an additional $5 surcharge to all points in the State of New York. Additional to this, you can expect that you will need to pay around USD$13 worth of tolls through your journey. Taxis are comfortable and safe and usually one of the quickest ways to get into NYC from the Airport in Newark, with door-to-door service. However, taxis are at the mercy of traffic, so as well as a queue to catch a cab, you can be stuck in traffic during peak times which can be expensive as well as slow. Never accept rides from solicitors in the airport. It is illegal to operate outside of an official taxi chain in NJ and NYC and therefore you are not covered by any protection that the law offers in official cabs, such as overcharging. If you have a lot of luggage, it might be best to pre-book a larger taxi as there will be additional charges as well as lack of space is normal taxis, which are sedans by default. Although drivers accept both cash and card, there is a USD$5.50 surcharge when using a credit card. It is customary and polite to tip the driver. Always request and keep your receipt. There is an express bus, named The Newark Airport Express, that goes between Terminal A at Newark Airport direct to NYC, with stops at 3 major bus stations within the city. The bus stops at Grand Central Station (nearby to Midtown and Times Square) as well as Bryant Park and Port Authority Bus Terminal). The bus is subject to traffic conditions but should take around 1 hour in normal traffic. How much is the bus from EWR to New York city centre? The bus ticket costs USD$18.00 (15.40€). These can be purchased in advance on the express website or from the bus station at the terminal. Round trip tickets are also available for purchase. Buses run every 20 minutes between 9:00am - 11:00am and then every 30 minutes the rest of the time, between 4:00am and 1:00am daily. The Express bus stop is located at Terminal A — Located on Level 1, outside at Bus Stop 5. The express bus departs from the airport terminal which is convenient, however the traffic can affect how 'express' the bus is. As well as this, the price of the ticket means that it is not any cheaper than taking the train. There is another option to take a local bus - however this involves taking two trains to get to Penn Station Newark before taking the bus. The AirTrain arrives and departs every 3 minutes between 5:00am - 12:00am and every 15 minutes between 12:00am - 5:00am. The express bus and AirTrain are in operation 365-days a year. Taking the train and/or bus avoids tolls. How much is a taxi from EWR Airport to NYC? A taxi from the airport is metered and therefore is likely to be affected by traffic and peak hour surcharges. Taking a taxi in normal traffic should cost around USD$50, but will also include a tip as well as tolls. How many transfer options are there from EWR Airport to NYC? There are 3 transfer options between the airport and NYC. The most comfortable for those with luggage is by taxi, which will take around 30 minutes. If you take the train, you will need to complete a couple of transfers, however the journey will be cheap and take around 45 minutes. Finally, there is an express bus available, which will take around an hour, but leaves directly from the airport and is reasonably priced. How far is EWR Airport from NYC? Newark Airport is located in New Jersey, the neighboring state to NYC. The airport is around 31km away and a journey by car in normal traffic should take around 30 minutes.